Some say “necessity is the mother of all inventions,” well that became evident to me one spring day in early 1996 when I brought my then 4 year old and 7 year old daughters to play at a local park. We were very excited to finally get out of the house from the winter doldrums and get some fresh air at the playground. My older daughter was thrilled to have a place to run around and I was just thrilled to get outside after winter. When we got to the playground it was the usual ritual of letting my older daughter out of the car and having her bolt like lightening to the playground area, and for me, not so fast. I had to lift the wheelchair out of the back of the station wagon and then put my 4 year old daughter into it. When that 5 minute ordeal was over, we were off but almost immediately we were stopped by a timber barricade which seemed to be placed there to keep in mulch but very obviously was a problem for us. So, as usual supermom that I am, picked up both the wheelchair and my daughter over the timbers and then thought we were off. But again, not so easy to push a wheelchair over mulch, think of trying to drive over sand; it’s not so easy, is it? We then caught up with my older daughter who was running from each piece of equipment to the next. When I finally told her to “hold up.” She exclaimed she wanted us to “come up” on the equipment. Come up? Now how exactly was that supposed to happen? Oh, I know the wheelchair was supposed to sprout wings. Well, that is what it would have taken to get her up on the equipment. And let’s say that actually could have happened, then what? Sit up there and watch from the tower while her sister ran around and around. This was no fun! So my younger daughter and I went over to a seating area where I sat and we both watched my older daughter run around. At one point my older daughter came over to us a little frustrated but then realized when she came over to us that my younger daughter had a tear dripping down her face. That was it! That was the moment I went from a stay at home mom to a mom on a mission! Why was there not anything my children could do together? 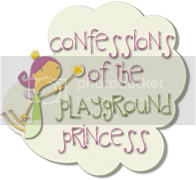 Why was there not anything I could do with my younger daughter while my older daughter played? This was going to change, it had to! I went home and started drawing (coming from a design background, drawing was second nature to me) and visualizing what a perfect playground would look like. When my husband came home I told him of the adventures of our day and how I was now out to change the world. I had a dream; a goal- “to build a unique park where all children could play together with or without disabilities.” A park where through playing, the concepts would help all children socially, and cognitively, as well as physically. 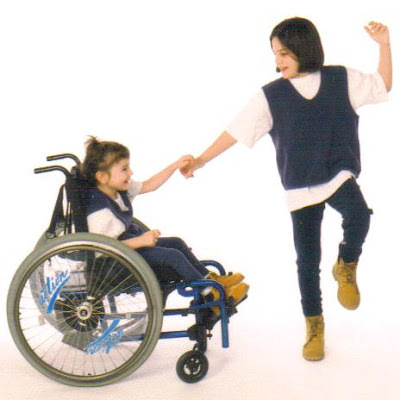 Equally as important, a place for children with disabilities to play with their own siblings and peers. 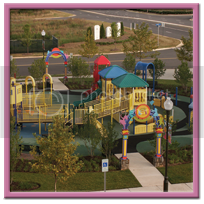 The ideas and visions of this playground resulted in the development of a theme-play park. Often a playground is considered strictly physical. Although, when the physical play is mastered, the appeal of the playground can lead to boredom. 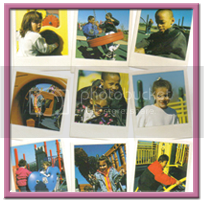 Theme-play offers a challenge to the child’s imagination and encourages children to play for extended periods of time. My dream playground encompassed a Transportation Area, Pirate Ship, Frontier Village, Castle, Dinosaurs, and Main Street themes. 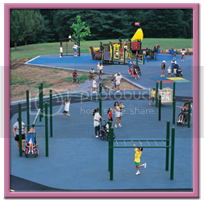 In the design, accessibility was ensured through the implementation of the ADA requirements, CPSC and ASTM guidelines; those are playground rules. By combining all of these elements in the design and equipment, my dream would create the best playground for all children to play! Congratulations on your wonderful work. I hope the spark spreads and more parks are outfitted so that all kids can play and enjoy. Hi there! I saw your response and follow on my blog from the MBC 100 club. Since your other blog has over 100 followers I thought I would return the favor and follow this one. I myself have become a little more sensitive than I already was to these issues when I was in a car wreck in December and couldn't walk for nearly 3 months. Picking my son up from school was definitely a chore and playgrounds were out of the question, despite both of them being located on our street. Dad took him but I wanted to go too. I wish you all the luck bringing awareness to this important and often neglected topic. All people need play, especially children, it is sad to think there is exclusion in this day and age. WOw thats truly wonderful! I am following you from MBC 100 club. Very inspiring. Congratulations on all your hard work. I'm following you now too. Thanks for stopping my blog. Hi shelly! thats so cool! You just posted on my blog and I came to read yours.. I understand now, how you came to go to Dr N. My son went to him to get his broken arm set. What a character he is! I do wish they would build playgrounds to include all of our children. My son loves to go to the playground, but there is a lot that he just can't do. Hi from the SITStahood. Congrats, it is great to have someone step up and make change happen. My son goes to a school that specializes in children with all sorts of disabilities and they are building one of these parks. So far it only has some specialty swings, a rocking bus ( instead of those single person horses) a regular play gound and some play houses. But there is a ton of stuff that will be added in the next couple years ( it is completely built by volunteers) including the pirate ship. It has padding instead of sand and is wheelchair accessable. It is great!! Hey Shelley, thank you for stopping by our blog and being a follower waving a big hello from downunder. Hope you joined the "Blog-Link". following from the MBC club. Thanks for stopping by my blog and taking a lookie! Are you on MMB too? Just curious. Your idea outstanding. Do you KNOW people you can take this idea too to actually have it done? WOW! I really hope that this park can be made a reality cause I am sure there are a WHOLE lot of moms out there just like that have the same problem. Way to go Inspiration girl. Maybe you could talk to Ty from extreme makeover and he could help you build this amazing playground. This is an amazing idea---WOW! Thanks for sharing! How lovely to meet you and have you stop in to my blog. You are on a very worthy mission I see and so happy to hear you were inspiring them in Ontario where I live. You sound like you are a fearless woman, when my son was ill I became quite fearless as well in getting him help so I understand what is giving you your energy and drive. Most inspiring and I will check back in to watch your progress. I will leave you with a good quote from Three Cups of Tea..."When your heart speaks, take good notes". You have already done that! Wow..you are truly inspiring. 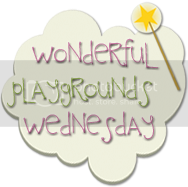 I have to say playgrounds SHOULD have something for everyone! I commend you on your mission, our children are so important to us. Thank you for stopping by my blog...that was so nice. Im following you now and hope to learn more about your projects!!! Whoever says that one person can't make a difference needs to see what you have done. I am happily following your blog from MBC. A friend of mine is part of our local chapter and it seems like a great organization. Just thought you might be interested. I think what you're doing is wonderful, and I hope your dream theme park becomes a reality. My sister works with adults with disabilities and it's an eye-opener to see the world through a different lens--your blog is helping share the view thru that lens. Good luck to you! Your blog is wonderful and I wish you all the best in your journey to make your dream theme park a reality! Good luck! Thanks for checking out my blog (www.tempachure.blogspot.com). I am following you from MBC. I love the blogs and it gives me great reference point. Keep up the great work! Beautiful post.. Prayers for you and your Daughters. What a great story and so very touching. I am your newest follower. I'd love to have you follow me too.